Recently renovated, the Fairwind Villa at Cap Estate is ideally situated for a private getaway to St. Lucia. Located in a gated community, this three-bedroom villa is designed for secluded elegance. You can enjoy views, barbeque, a swim in the pool, or relax and talk with your family or friends from your private terrace. On the first floor, you can enjoy the sundeck. Outside, you can stroll through the tropical gardens on the grounds or just enjoy the beach, which is just a few minutes away from your villa. Fairwind Villa is perfect for escaping and enjoying a serene, Caribbean vacation. Close to the beach, golf and water sports! 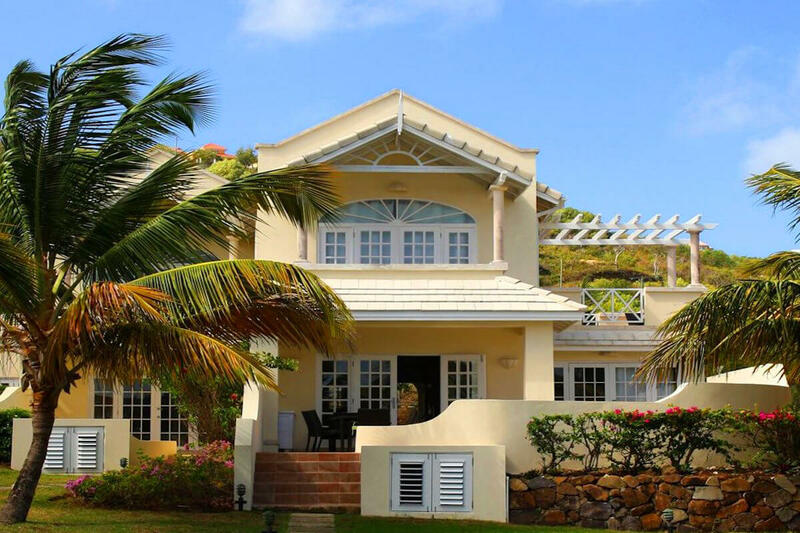 Fairwind Villa is a beautiful Caribbean-style house located in the gated community of Villas On The Green, in the residential area of Cap Estate, located on the northern part of the island. Villas On The Green is a recent luxury development along the 18-hole golf course of Saint Lucia, just a few minutes’ walk from the Cas-En-Bas beach and a few minutes’ drive from Rodney Bay, the island’s entertainment center. The 1,800 square-foot Fairwind Villa has recently been upgraded (2013) with an extended terrace and pool, and the decor done by a renowned interior design team, G&G Interiors. The plantation-style furniture is brand new, with all new linens, tableware, some appliances, etc., all carefully chosen for their quality and refinement. The main entrance opens to a large living and dining room and a fully equipped modern kitchen. The living room comes complete with a 47-inch flat-screen TV with 100 channels, a DVD player, telephone, and Internet with secured wireless network. A guest restroom, a laundry with washing machine and dryer complete your comfort. HIBISCUS, located on the ground floor, offers a queen-size bed and en-suite bathroom. It has direct access to the terrace and pool. The other two bedrooms are located upstairs. WATER LILY, with its king-size bed and en-suite bathroom, has its own balcony and provides access to the sundeck with a view of the ocean, the tropical garden, and the golf course. CORAL has a queen-size bed and en-suite bathroom, and this room captures a beautiful view of the hills of Cap Estate. All the bedrooms are equipped with air-conditioning and ceiling fans. You can enjoy dinner, a barbeque, or just sunbathe all day next to the pool on the 550 square-foot terrace. Fairwind Villa offers you all-in-one personalized service that will make your stay even more enjoyable. Maid service and pool maintenance are provided twice a week. Laundry and ironing services are adapted to your needs. A basic grocery stock (sparkling water, rice, pasta, spices) is included in the rental price, but we are happy to provide you with additional items, if required, for an additional fee. Guests of Fairwind Villa have access to the nearby Cotton Bay Village and all its amenities (beach, common pool, fitness center, and restaurants). At Fairwind Villa, we offer the complete holiday, lazing at the beach, golfing, enjoying water sports. Fairwind Villa is the ideal home base for your vacation. The charming house welcomes honeymooners, and families and friends as well. The large terraces and the private pool are ideal to relax in and recharge your batteries. The Caribbean way of life, with the charm of the Saint Lucians will make your vacation unforgettable! A few minutes walk from the unspoiled beach of Cas-En-Bas and a few minutes drive from Rodney Bay. A basic provisioning stock (sparkling water, rice, pasta, spices) is included in the rental price, but we are happy to provide you with additional items if required at an additional fee. Guests of Fairwaind Villa have access to the nearby Cotton Bay Village and all its amenities (beach, common pool and fitness centre and restaurants).